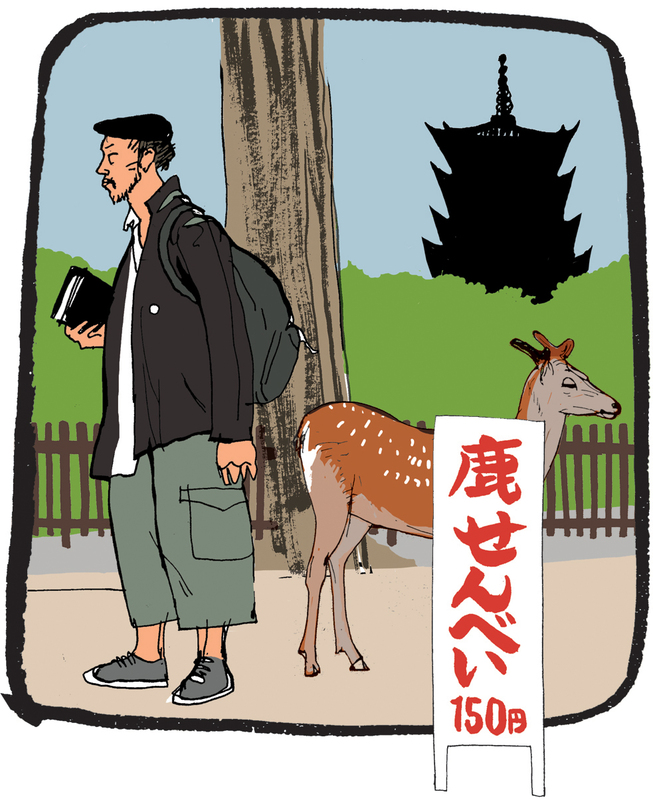 An elderly woman is praying at an outdoor shrine, tenderly stroking the Buddha’s hand, and a large crow alights on the branch above, cawing four times… In the Kofukuji temple grounds, the deer are everywhere, weaving into the crowds, sniffing foor food. Clusters of schoolchildren tease them with sembai they buy for 150 yen, and the deer get stroppy and prod the children, who giggle and wiggle and shriek nervously. Elderly women in white overalls, sun hats and masks, sell the crackers, and sweep up the results from the ground around. A man engages us in fluent English: where are we from? where are we going? These are not polite questions: they are philosophical ones. He’s a writer, a poet, a thinker. Then: Why are we going to Koyasan? Because it’s in the Lonely Planet guide? “Publishers are worse than pimps! People flocking from place to place because the books tell them to! Guide books are EVIL!” He taps the bible he carries – “Most people are sparrows, but some… some are falcons!” (He’s getting quite exercised now). “The printing press was THE WORST INVENTION EVER!” (I start to bluster, but…) “You must follow your heart.” (Yes, in general…) Now, would we like to make a donation for his writings? he asks, offering his printed pamphlets.